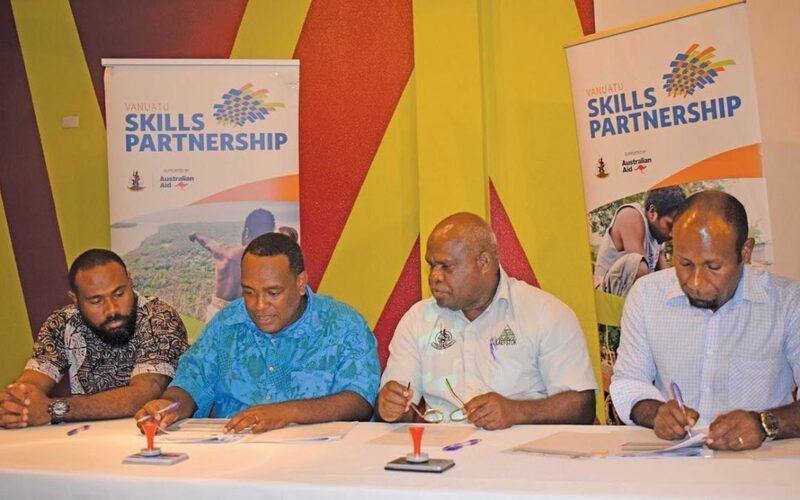 More government departments have joined the Department of Tourism (DOT) to pledge financial assistance to the Vanuatu Skills Partnership (VSP), recognizing the importance of enhancing inclusive growth through skills development. The DOT was the first to show its commitment last year with Vt3 million. The Department of Agriculture and Rural Development (DARD) and the Department of Industry (DOI) made their initial commitment up to Vt5 million in a Partnership Implementation Framework signing recently. The DARD announced Vt3 million, the DOI gave Vt2 million while the DOT remains committed with another Vt3 million this year. The Department of Livestock announced its commitment of Vt3 million but is yet to formalize this in a formal agreement. These funds will be used to deliver skills training and implement activities that will meet the priority skill needs of the productive sectors. VSP is the new name for phase 4 of the Vanuatu Skills Economic Growth Program. Formerly known as the Technical and Vocational Education Program (TVET), the Australian funded VSP program deliver skills demand training and development services for productive sectors through provincial Skills Centres. The government of Australia has been funding the program implemented under the Ministry of Education and Training (MOET) for over a decade now. It is a concern that the government of Vanuatu should be able to deliver program once the initial funding from Australia stops. The Director of VSP, Fremden Yanhambath, thanked each of the departments for their commitment. “It is an achievement since the establishment of the program and a start to more active partnership. “The cost of delivering skills training to the remote areas is very expensive”, he added. The Director of DARD, Antoine Ravo, said: “Vanuatu recognizes that development requires significant improvement in the productivity of our primary industries and a sustainable improvement in food security in the face of increased risks from climate change and natural disasters. “DARD is committed to ensuring these improvements are brought about to benefit the backbone of Vanuatu’s economy, primary producers and people. “A key area for achieving these improvements must be the training and skills of our staff, especially those who need to advise and work with our farmers, fishers and foresters. “Our staff need further skills training and development services to ensure they are innovative, strategic and high performing. “They are dedicated and enthusiastic but we recognize many areas where their skills need o be upgraded”. Prior to the partnership agreement, each of the departments presented their 2019 priorities to VSP.